Salt Bath Annealing Kit with Standard Case Holder. Although the salt can be reused indefinitely, you will lose some to drag out. The salt jar supplied with the kit is sufficient to fill the Lee Precision Melter pot for first use and keep it topped up through the annealing of several hundred cases. If you expect to anneal frequently, getting an extra jar of salt is a popular option. A no-salt kit is also available for those wanting to buy the tools, but living in areas that I cannot ship salt to. 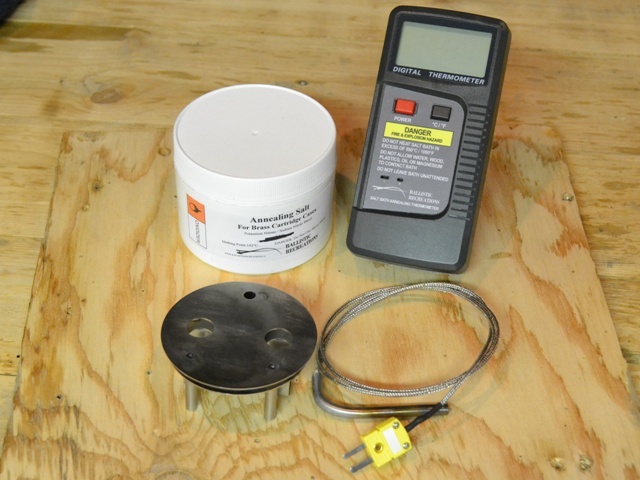 Salt Bath Annealing Kits are available with your choice of standard or large Case Holder. Kits containing salt cannot be shipped overseas, to Hawaii or Alaska.